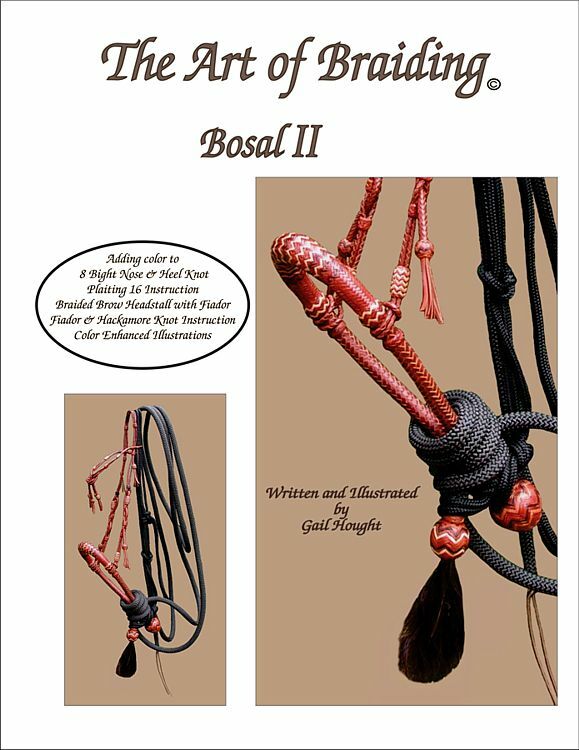 The Art of Braiding, Bosal II, is very detailed and in color. It focuses on adding contrasting color to the 16 plait, 8 bight bosal nose button and heel knot. 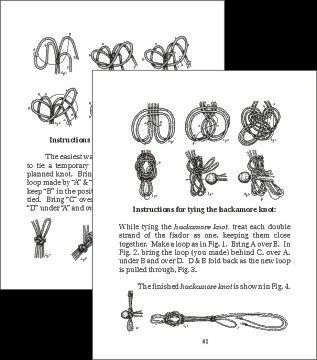 Instructions include making a 12 plait bosal, 5/8" diameter core with a 6 bight nose button and heel knot, a good size to learn how to make a bosal or hackamore. Additional instructions are for a 16 plait, 5/8" diameter core with an 8 bight nose button and heel knot. There are detailed instructions on sizing materials needed. *Detail instruction on sizing materials needed. *Plaiting 16 with instruction on tightening and finishing plaited core. *How to space for added color. *How to add color in a balanced, symmetrical pattern. *Adding 1st contrasting, then a 2nd contrasting color in 2 places to teach both skills. *Adding contrasting color at the nose button ends. *Where and how to bury strings most effectively. Instruction on the 8 bight heel knot. *Adding contrasting color in the full pattern or in partial pattern. *Learn to fill areas of the heel knot by adding rows in the areas needed. *Tightening and finishing heel knot. *Braided brow headstall with fiador. *Instructions on braiding the button on end of fiador with hair tassel. *Instructions on tying the fiador and hackamore knot. To order this book online, see main braiding book page or order on this page.